The return of Carnival Cruise Line&apos;s Fantasy to Mobile in 2016 has generated excitement among the cruising public, travel agents and local citizens. 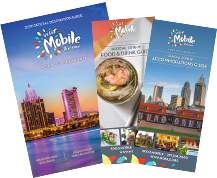 With the opening of over a dozen attractions, restaurants, bars and shops in the last several years, Mobile is positioned to offer exciting experiences to cruisers before or after they set sail. Area hotels are offering great Park & Cruise packages - see the listings below for details and links to reservation pages. New this time! Click the VERY IMPORTANT CRUISER badge directly below for discounts at area attractions just for Carnival Fantasy passengers, valid by showing your boarding passes. Look for the badge in area shop and restaurant windows, too, for even more discounts for cruisers!